First it was mosquitoes. Literally hundreds of them would be wandering around our bedroom each night (we used to vacuum them! ), until we found the (several) places they were coming in. Next it was cockroaches, large and small, to be found in the most unexpected of places. Roaches are standard fare in this city however, so a few visits from the exterminator to the building put an end to them (at least for the present). And lastly, we’ve had ants. Tiny Argentine Ants, maybe 2 to 3 millimetres in length, turning up everywhere that there’s food exposed. We’d find them in the sink every morning if we didn’t do the washing-up the night before. In cakes (even when in a supposedly airtight container), in the rubbish bin, in the bathroom (very often in the bath for some reason? I guess they’re easier to see there), and finally, the other day, feasting on our medialunas on the living-room table. We took to following them (they make these hilarious little trails) and blocking the hole they came through with a little silicone gel. This stopped them for a short while, but they quickly find another route. Other common remedies (washing their trails with soapy water, spraying with vinegar, salt barriers, coffee grounds) also offered brief respite. Happily now however, it appears that we have found a solution (although I say that very tentatively, it’s early days yet) – boric acid. This wondrous substance (used for cleaning apparently) works as a slow-acting poison which allows the ants to bring the foodstuff (with which it is mixed) back to the nest before killing them (and hence destroying the ants in the nest also). 50% boric acid + 50% sugar, diluted in water (enough to dissolve the sugar). Soak kitchen paper towels in the solution and place on a small plate (the sugary solution will makes a mess otherwise). 25% boric acid + 75% honey, mixed until the boric acid dissolves. Ants eating the Boric Acid & Honey solution. Although both mixtures were effective (the ants ate both), the honey mixture (b) was much more popular (so popular in fact, that many of the ants drowned themselves in it). To give an idea of scale in the picture on the left: the piece of plastic that contains the honey solution is part of a light switch – about the size of a 2 euro coin. The ants found the mixtures after about 2 hours (which we placed in 4 different locations around the apartment). For the next 12 hours or so we had a continuous stream of guests (around 30 eating at time), then the numbers started to gradually decrease, down to around 5 after 24 hours. And now, after about 48 hours there is usually just one or two. Of course we can’t be sure yet if this will be a permanent solution (there is still a question whether the ants made it back to the nest(s) alive), but it is certainly looking positive for the present. Argentine ants are quite unique by the way: they share nests, never fight amongst themselves, and have several queens. Well worth reading about. 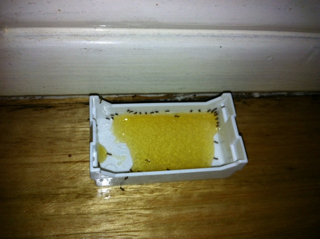 Edit (5 days later): Well the ants stopped coming to these particular buffet lunches, however we noticed that they are still very much present elsewhere in the apartment – so it seems that they became aware of the poison and have started avoiding it. 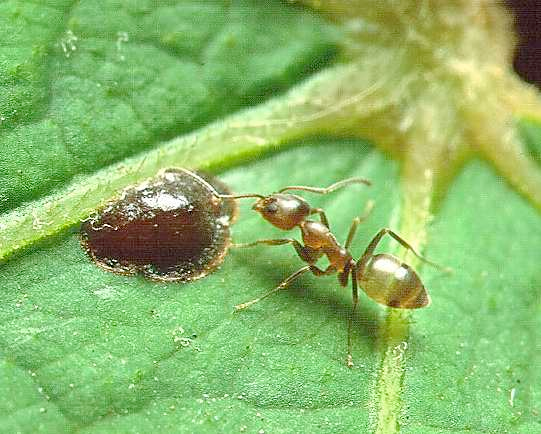 For boric acid or borate baits, the concentration of active ingredient that will be most effective in killing the colony (rather than just stopping the ant trail) is between 0.5% and 2%. Higher concentrations may be used to quickly eliminate ants indoors. So our 25% to 50% concentration was insane overkill! The optimum sugar concentration in liquid bait is 25%. Back to the drawing board then. We’ve mixed new traps, this time with 1% Boric Acid, 25% sugar, and the remainder water. We’ve placed these (4 of them) in (new) strategic locations around the apartment. Interest in them has been very poor so far: they’ve been down for about 12 hours now, and on the few occasions that we’ve checked we’ve had no more than 2 ants at any one trap (often none). Update (6 weeks later): Well the ants did express an interest in the new traps. For a week or two the numbers held at about 5 to 10 ants per trap at any one time (and even the corpses building up around the traps didn’t seem to deter then), and gradually the numbers reduced to maybe one at a time. We were considering removing the traps (now littered with ant corpses), when suddenly the numbers jumped significantly about a week ago, up to 10 or 15 at a time. These appeared to be new ants, often bigger than the previous ones (if only very slightly), who were re-exploring all the tracks that the other ants had used previously (even the dead-ends). Now this new batch has begun to reduce in number also, and the ants arriving are getting smaller – so it would appear that the traps are having the desired effect on this nest also (or at least the ants have communicated to one another that the traps should be avoided). The plan currently is to leave the traps in place for another few weeks – until they no longer receive visitors.